Customized & ready in 1–2 days! 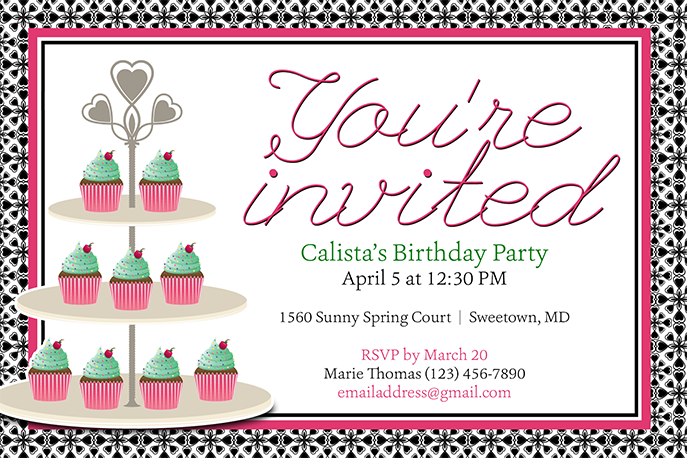 Bright and colorful with cupcake treats, this printable birthday party invitation is for celebrating a girl that’s super sweet! Design reads: “You’re invited” followed by name, date, time, address, RSVP date, and host name, email address, and phone number. Style Tip: Coordinate this design with a bright pink or green envelope. Fast and eco-friendly! Only print the number of invitations you need, right from your home computer or the print vendor of your choice. 1 customized digital file sent to you within 1–2 business days or sooner; no physical product will be shipped.